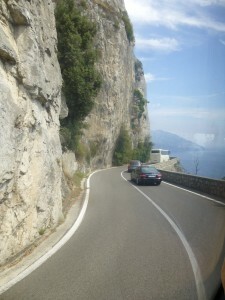 I finished my tour of Italy in the South. I took the Trenitalia fast train from Rome to Naples (about 70 minutes), then transferred to the Circumvesuviana train from Naples to Sorrento (about 1 hour). I had rented a furnished apartment for 3 days and was met at the train station by the apartment owner who gave me a ride in his Mercedes. The apartment was only three minutes away, but after lugging my bags through three train stations, I was happy for the ride. He showed me around the apartment and gave me tips on restaurants and things to do. He recommended Pizzeria da Franco for pizza, so I tried it out for dinner. I had a green salad and a Margherita pizza with red sauce, mozzarella, and basil. It came out hot and fresh from the wood fired oven and the taste was amazing – probably the best pizza I’ve ever had. I woke up the next day still thinking about that pizza, so I went back to Pizzeria da Franco for a late breakfast/early lunch. I was the first one there, but as it got later more people showed up; clearly it was popular with the locals. I enjoyed looking at the display of homemade breads and cheeses, as well as fresh meats and olives. I was even more impressed with the place when I saw a waitress give two free pizza slices to a homeless man who came asking for food (I can’t think of the last time I’ve seen that at home). 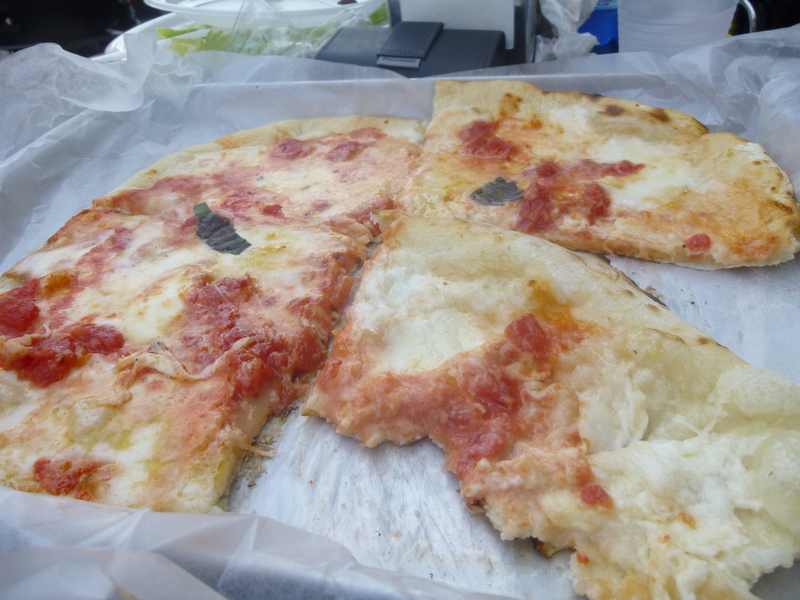 After I finished my meal (yes, it was just as good as the first time), I headed to the nearby bus station and bought a ticket for the SITA bus to the Amalfi Coast. At €6.80 for a round trip ride, the ticket was a great deal. The SITA bus wasn’t like a regional bus in the USA, but more like a tour bus with clean interiors and comfy fabric seats. During the 1.5 hour ride, we traversed the narrow mountain road through Praiano, Positano, and Amalfi and were treated to amazing cliff side views of the coast and Mt. Vesuvius. 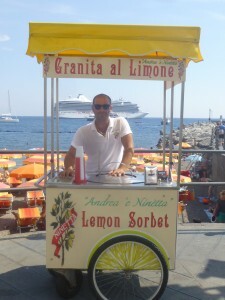 I got off in Amalfi to do some sightseeing and enjoy some Italian treats. My first stop was a street vendor selling lemon granitas, a frozen dessert that’s like a cross between sorbet and snow cones. 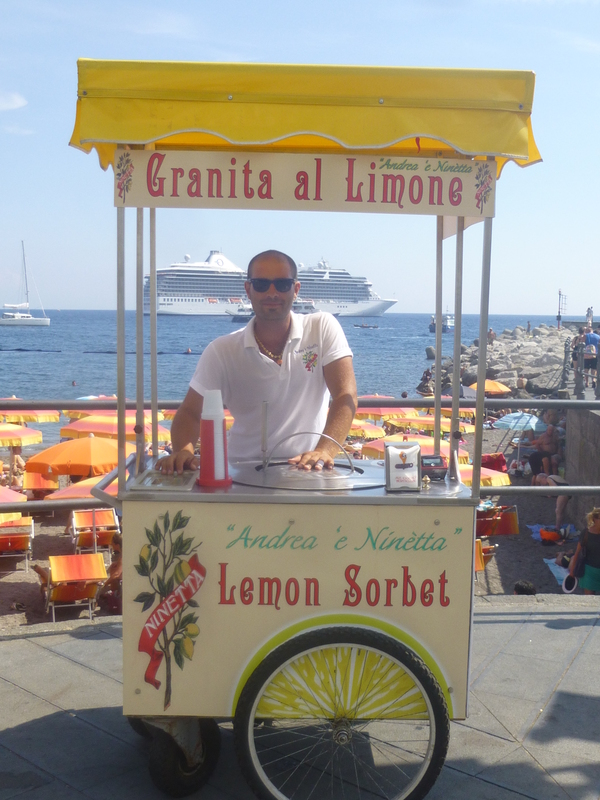 Made with local Amalfi lemons, it was cold, fresh and tasty, the perfect treat for a hot, sunny summer day. The vendor, Andrea, struck up a conversation with me and even offered (flirtatiously) to give me a ride back to Sorrento on his scooter. I graciously declined and went on my way to explore the city. 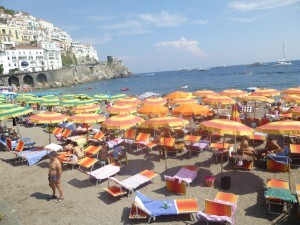 I walked down to the beach which was packed with people sunbathing and relaxing under brightly colored umbrellas. After a quick walk in the sand, I headed back up to explore the stores and souvenirs shops; I viewed a variety of clothes, ceramics, lace, and of course, lemon-related items and bought a few souvenirs. Along the way, I stopped for a tiramisu gelato on a cone. Needless to say, this wasn’t a time of dieting for me. 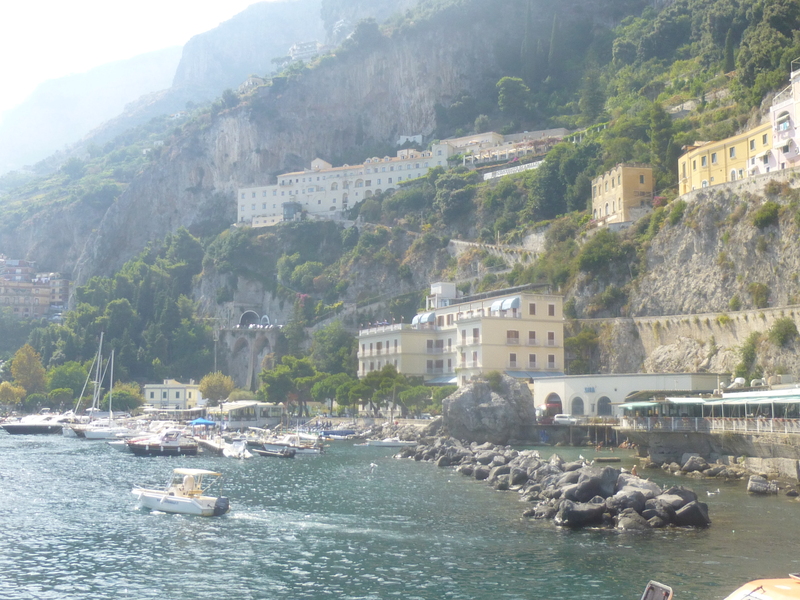 Amalfi was beautiful with many hillside buildings overlooking the coast. It was vibrant with many small boats and ferries docked at the shore and tons of people walking the streets. After several hours, I was ready to return to Sorrento. However, getting back there was an adventure. It seemed as though all the bus drivers were simultaneously on break, and thus most of the buses were parked as hundreds of people waited for the northbound ride. Finally, after nearly 30 minutes a northbound bus arrived. Unfortunately, it was already packed with people and I had to stand for most of the trip. I was jerked and prodded for nearly an hour as people entered and exited the bus. I was excited (and so were my feet) when I got a seat for the last 30 minutes of the ride. Back in Sorrento, I window shopped along the main street, Corso Italia, before heading back to the apartment for the evening. On my second full day, I had intended to visit Capri and Positano but the weather had other plans. I woke up to a rain storm that lasted for most of the day. I was stuck inside until about 2 pm, when the hard rain finally petered out. The clouds suggested the rain would return, but I took advantage of the break to explore the city. I headed out to Piazza Tasso in downtown Sorrento, stopping for a late lunch. I took a break from pizza and pasta and ate roasted chicken and vegetables instead. After lunch, I walked through downtown exploring the local stores, souvenir shops and a historic church. I was out for several hours before I started to feel light rain drops. I decided to make my way back to the apartment, and sure enough, not long after I got back the heavy rain returned. I guess the rain gods were looking out for me. The next day, my last in Southern Italy, I took the Cirumvesuviana train back towards Naples. The train was an adventure in itself. 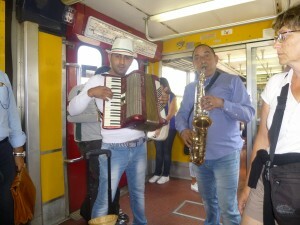 It was packed with people (mostly tourists) and musicians walked though the train playing music and seeking tips from riders. After about 45 minutes, we arrived at the Ercolano Scavi station which is the stop for Herculaneum. While most have heard about Pompeii, which was destroyed by the eruption of Mt. Vesuvius in 79 A.D., few know about the nearby town of Herculaneum (Ercolano in Italian) which was also destroyed. 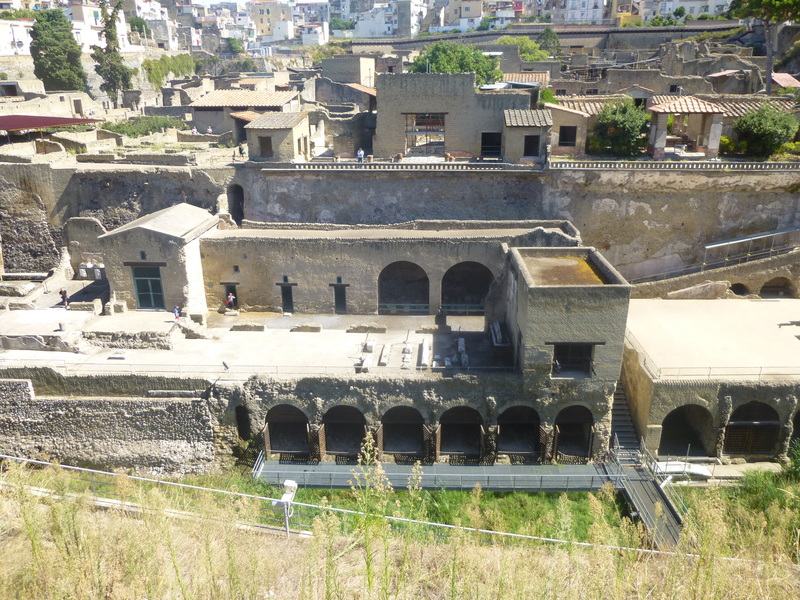 I’d read that the Herculaneum site was smaller and better preserved than Pompeii, so with my limited time I chose to visit there. At the entrance, an Italian guy named Luciano offered guided tours for 10 euros per person. I joined his group and soon we were off for the tour. Luciano shared historical information and offered insight into various buildings we viewed. I was glad I’d taken the tour because there was limited signage and his explanations helped me visualize things as they were many years ago. After the 1.5 hour tour, Luciano and I took a photo together and bid each other farewell. I strolled around the site for another 30 minutes before heading back to the train station for my return to Rome. I flew back home the following morning leaving a little bit of my heart in Italia. What is your favorite thing to do in Southern Italy? Share your comments below. Ahhhhhh Italia! I love it so! Over two trips I have now been to more cities there than anywhere except America! I was just in Sorrento in September and wrote about it soon to be published. I’m sad you didn’t make it over to Capri. It is breathtaking! I still want to visit Milan! How cool, we were crossing paths in Sorrento. I was there in early September. Yeah I was bummed that I didn’t make it to Capri, but I guess it just gives me another reason to return. There was so much I wanted to see in Italy, but as always never enough time. Next time I have Milan, Venice and Tuscany on my list. Looking forward to read about your trip. I miss eating pizza (well everything) in Italy. I wish that I had the chance to head to southern Italy during my trip; I only made it from Rome northwards to Milan. 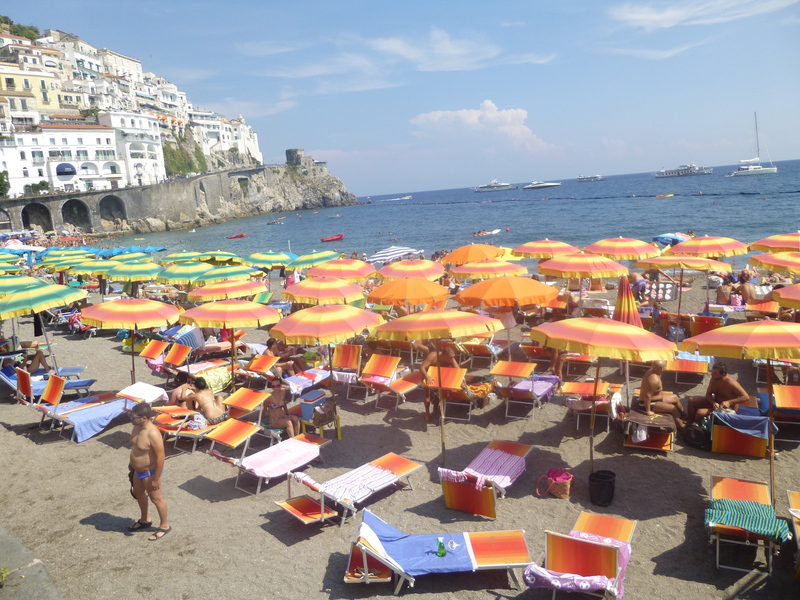 Amalfi is VERY high up on my list!